A delightful transport through time, The Rancher Takes a Cook brings history to life with realistic characters, a colorful setting, and comfort food that teases your appetite! When their South Carolina home burns to the ground, Anna Stewart’s only choice is to move with her younger brother to the wilds of a Texas ranch. 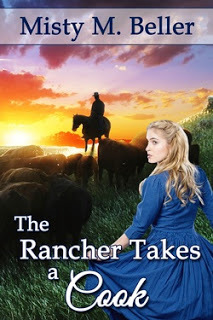 Their prospects are beginning to look better, until the rancher’s son, Jacob O’Brien, shows up with his alarmingly blue eyes to put a kink in Anna’s well-controlled plans. Misty M. Beller was raised on a farm in South Carolina, so her Southern roots run deep. Growing up, her family was close, and they continue to keep that priority today. Her husband and two daughters now add another dimension to her life, keeping her both grounded and crazy. You can find her on her website, reader blog, marketing blog for authors, Goodreads, Twitter, Google+, and Pinterest. Or check out her books The Lady and the Mountain Man, The Lady and the Mountain Doctor, or The Lady and the Mountain Fire. Or her latest book, The Rancher Takes a Cook. The July Release Clash is on! Announcing the 2015 Laurel Finalists! Presenting, a Titus Ray Thriller!